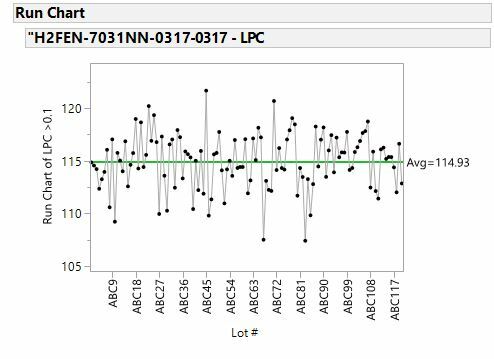 How to automatically save run chart image in script? I created this script to open a text file, filter the data, and then generate a run chart. Is there away I can also have the script automatically save the run chart as a .gif/.jpeg file in a chosen directory? The exact script can be seen below. Thank you for the help! Re: How to automatically save run chart image in script? To verify my approach, I created a data table with the same columns your data table has, then I ran your Data Filter, Subset and Control Chart Code, with my 2 changes, and it worked without issue. Here is the copy of your code with my 2 changes. The 2 changes are that I added "cc=" in front of the control chart platform so I could reference it to get the control chart to save. The second change is the "report(cc) << save picture(................." at the end of the script. That line will have to be changed to point to a folder path where you can save the output jpg. Attached is the jpg file the script produced. Thank you for the quick reply. This is the complete script below and is exactly what is in the script, minus the Save Picture function you gave me. I am new to JMP, so bear with me : ) I could be doing this the hard way, but I included a screenshot of what all is going on when I run the script. I could not get the save picture function to work...Thanks for your time. It worked like a charm! Thank you very much for your assistance. Is it possible to have the script automatically open an Excel document and insert the image to the document. That would eliminate the need to insert the image(Around thirty images) each time. That would be awesome. I am not aware of being able to do this. Maybe a Visual Basic program could be written to run the Control Charts in JMP and then take the captured objects and place them into Excel. This doesn't "open" a Microsoft document and insert the image, but it almost gets you there. It would require creating the Excel document using the Insert and Link feature to insert images. So, generate your document and insert files once and, thereafter, your JSL could automatically generate the images and save them in the linked location. The next time the Excel document is opened up the updated, linked image would be used.